Chur is a beautiful alpine town with a nice old town that is easy to walk around in. Walking to the old town takes about 15 minutes from the railway station and that makes it very accessible. 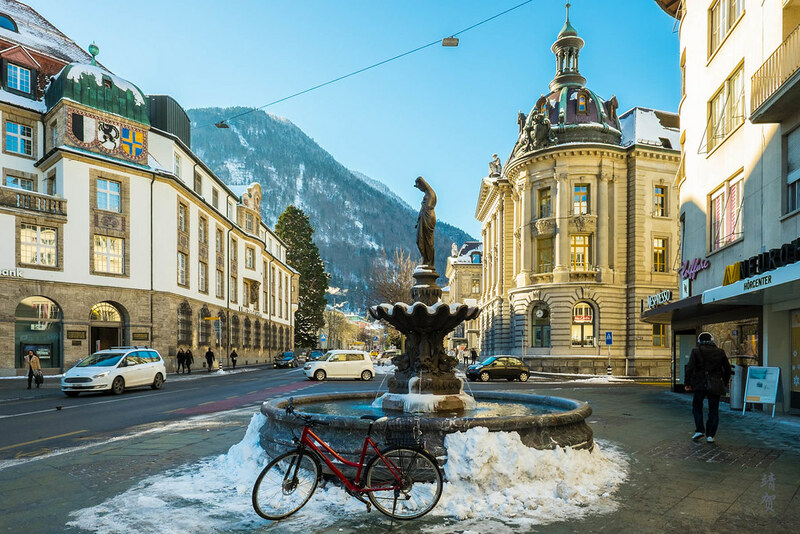 As one of the oldest if not the oldest town in Switzerland, it embodies the mountain spirit that is synonymous with Switzerland. Postplatz at the end of the Bahnhofstrasse marks the intersection where the shopping avenues lined with shops links to the Poststrasse – a major street in the old town. At the end of Poststrasse, the St. Martin church spire rises to guide visitors and the alleyways are lined with historical buildings like the crooked-looking city hall. Small fountains and plazas with cobblestone pathways adds to the ambience of walking around the old town. 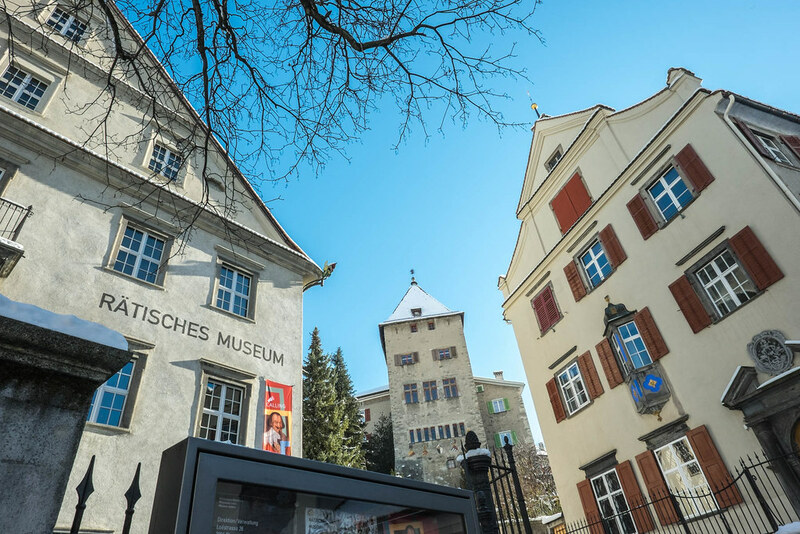 Behind the church, visitors can find the Rätisches Museum (Rhaetian Museum), which is a small museum dedicated to relics and artifacts from the Canton of Graubünden. Across from the museum, there is a staircase walkway that leads to the open courtyard of the cathedral which is probably the most imposing and largest building in the old town. On the outside, the cathedral looks plain compared to the church of St. Martin, but it is more beautiful inside. Nonetheless, the quiet courtyard makes for a pleasant morning walk especially when the nice weather brings out the sound of chirping birds. Scattered around the old town are sports shops, candy stores and restaurants but they are very quiet on a winter morning though it might liven up during lunch time or the evening. All in all, it is worth spending an hour or 2 strolling around the old town before I decided to have lunch and pack up to leave the city. After spending my morning walking around the old town of Chur, I boarded the regular scheduled service to St. Moritz. 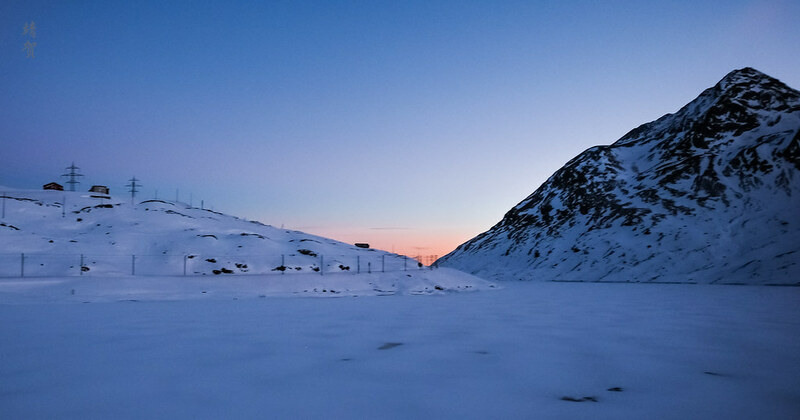 While there is the panoramic Bernina Express train, there was a surcharge (additional CHF5) and with only 2 morning departures in the winter at around 8:30am and 9am. The normal trains take the same route and provides more flexibility, and the afternoon trains will allow me to catch the winter sunset at around 4-5pm along the way. Like many things in Switzerland, the train departs on time like clockwork with clean carriages and I had no problem getting a booth of my own on economy tickets. The relatively empty carriage also meant I was free to head to the other side of the window to take photos if need be. If travelling from Chur to St. Moritz, I would recommend seating in the port (left) side, also the side one boards on for the first half of the journey until the train passes Thusis. 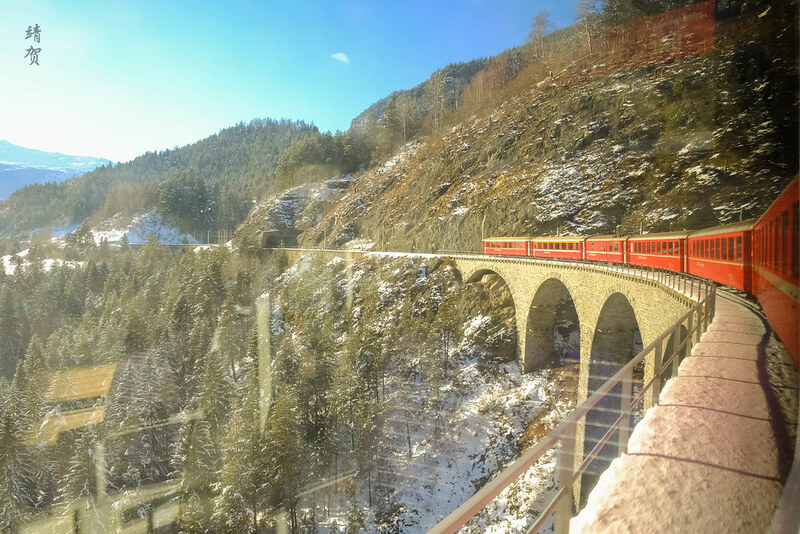 After Thusis, the train approaches the Landwasser viaduct which is the most iconic view one could get of this journey and the best way to experience this is by being seated on the starboard (right) side of the train. 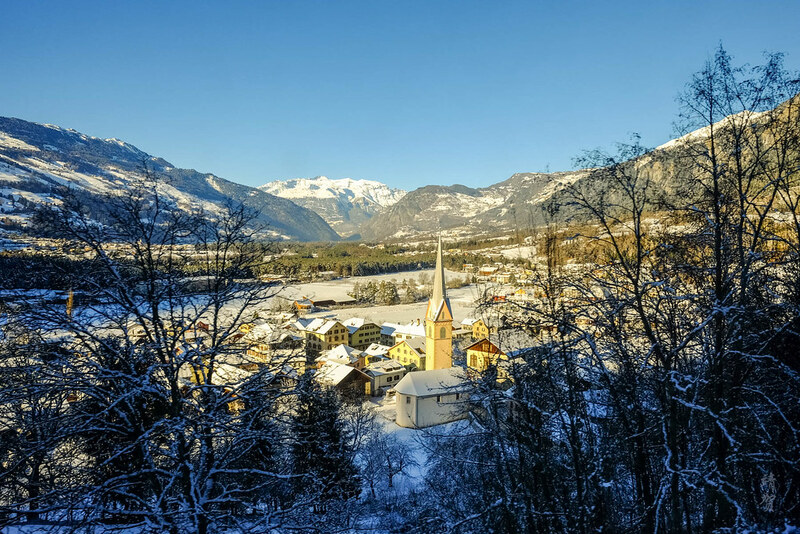 Starting out from Chur, the train passes by several other towns along the way and travellers can admire the scenery of Graubünden which is dotted with church spires and historical castles in the distance. Apparently the area is considered to have Europe’s highest density of castles. The train stops as well at the town of Domat/Ems and Reichenau-Tamins so these are 2 stops that travellers can consider boarding from. 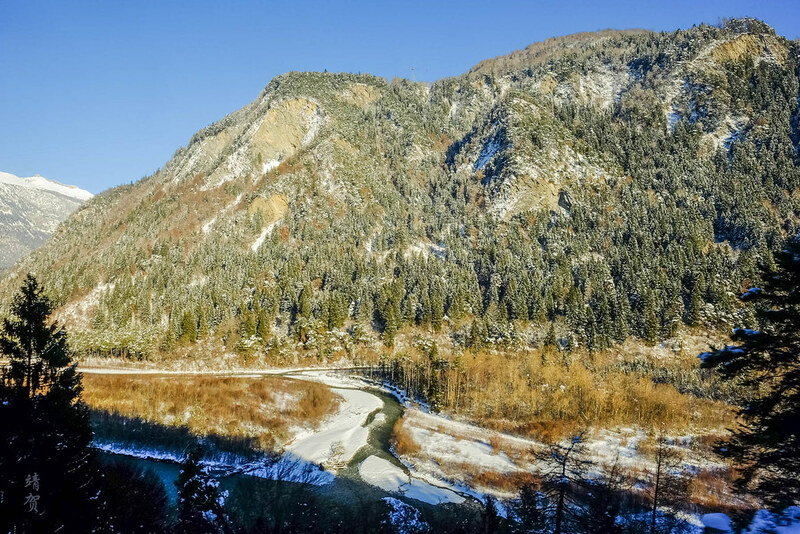 After these 2 stops, the journey becomes a lot more scenic and the first sight to take note is the Vorderrhein river valley as the train makes a bend past Reichenau-Tamins. After travelling for some time alongside the river, the train enters into another major town – Thusis where there is an extended stop. As the train departs Thusis, travellers seated on the port side should keep a look out for the church of Sant Cassian which has a spire on a small mound. The church has a striking background of the Alpine mountains and this makes for a nice photo capture. From Thusis onwards, the wide valleys seems to narrow as the train enters the Albula tunnel before emerging into the Solis viaduct, one of the many high crossings throughout this journey. 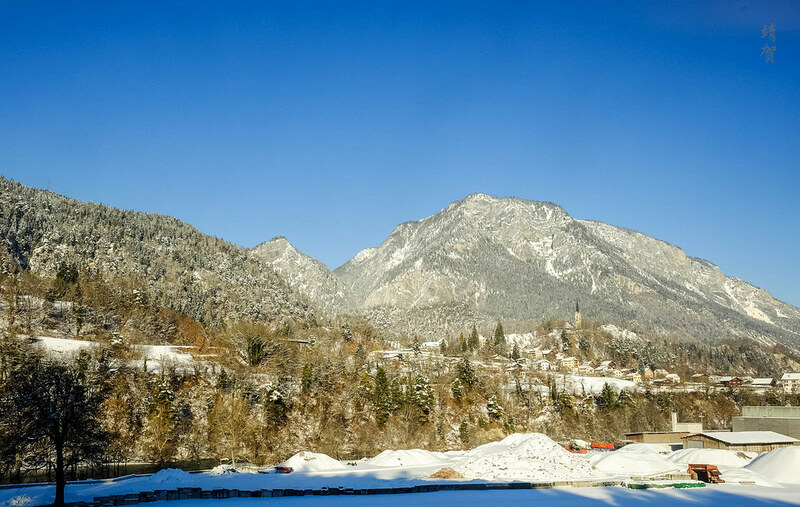 This stretch of rugged valley means the train goes in and out of some tunnels, winding its way through small mountain villages with quaint rural train stations. It is only after passing the town of Surava that the train approaches the Landwasser viaduct, which marks a turning point in the journey. The approach into Landwasser viaduct is fast and unannounced so travellers have got to be ready with their cameras as the moment passes by quickly. In a flash, the train passes through the viaduct and a enters a tunnel only to emerge at the other end with a view of the valley that we just traversed. 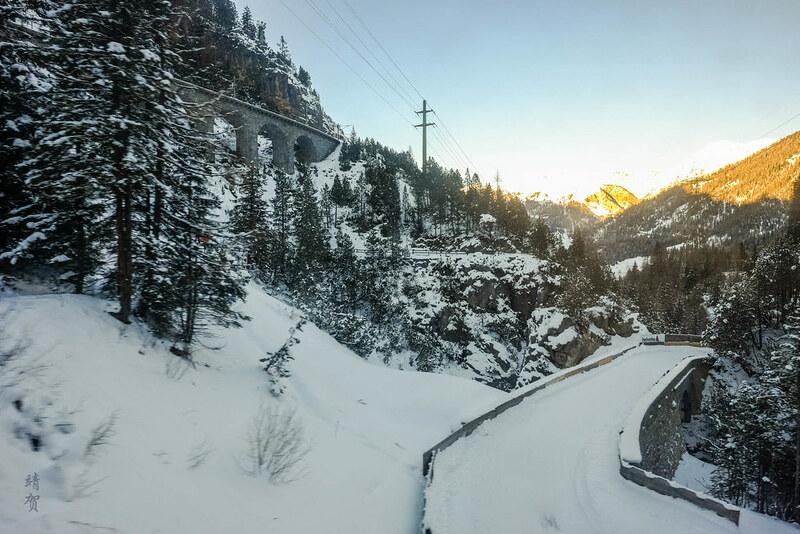 Some of the most interesting views from the Bernina line is due to the many winding train tracks along the way, providing travellers with the scene that they were just on moments ago! On the next stretch, the journey is not about the views out but rather the engineering feat as the train climbs up the valley using a network of tunnels and bridges. This feat is explained through an announcement on the train for travellers and it was an experience as the train goes in and out of tunnels in a winding pattern. 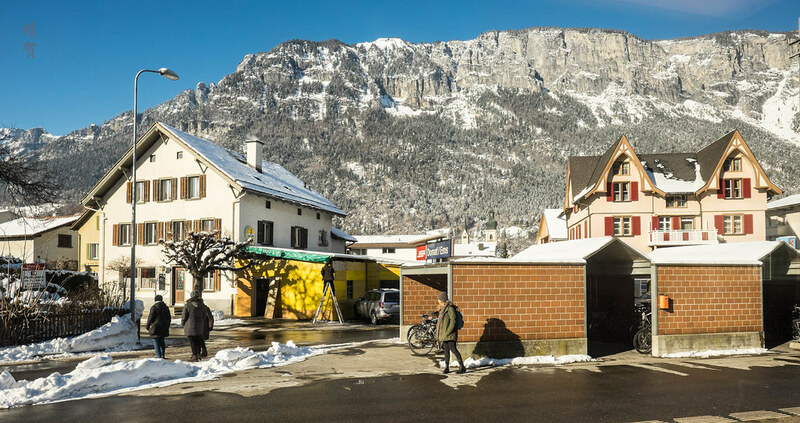 In between the train stops at the town of Filisur and Bergün which functions to allow alternation in using the sole train track. That means when there is a train on the opposite direction, the train will stop at either of these towns to allow the other train to use the track. 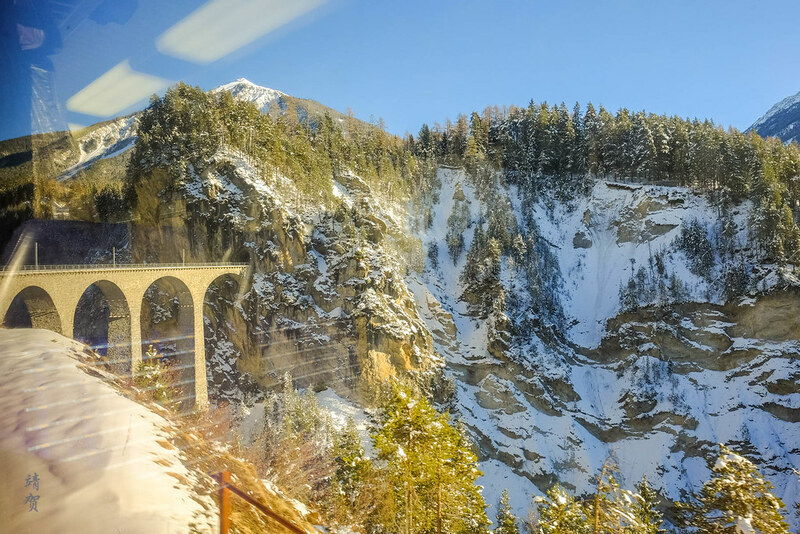 Continuing onwards, the journey goes on another rail full of twists and turns with the brochure for the Bernina Express describing the Albula area as the ballroom of the Alps. For trains that is. With the setting sun and tall mountains on both sides of the tracks, there is less light in the valley. What it does is create a more natural light to better appreciate the nature around us. Villages are smaller and our view are also obstructed as the train goes through a series of tunnels only to re-appear in a different environment and altitude. The whole scene unfolds like a drama! The train makes another stop at the town of Preda before entering a long straight tunnel to emerge at Spinas and the town of Bever nearby. 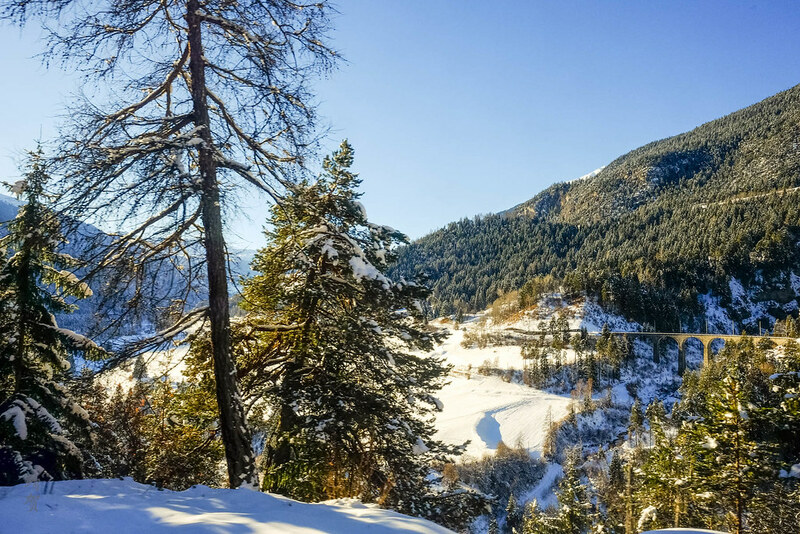 Bever marks the entry point of the train into the Engadin valley and the scenery opens up once more to wide valleys. 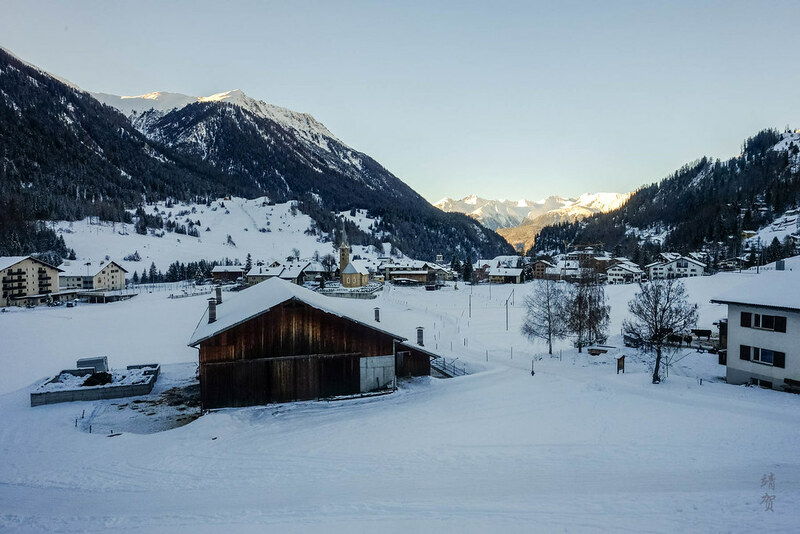 Travellers can try to spot the nearby Engadin airport along the way as the train chugs along the valley. 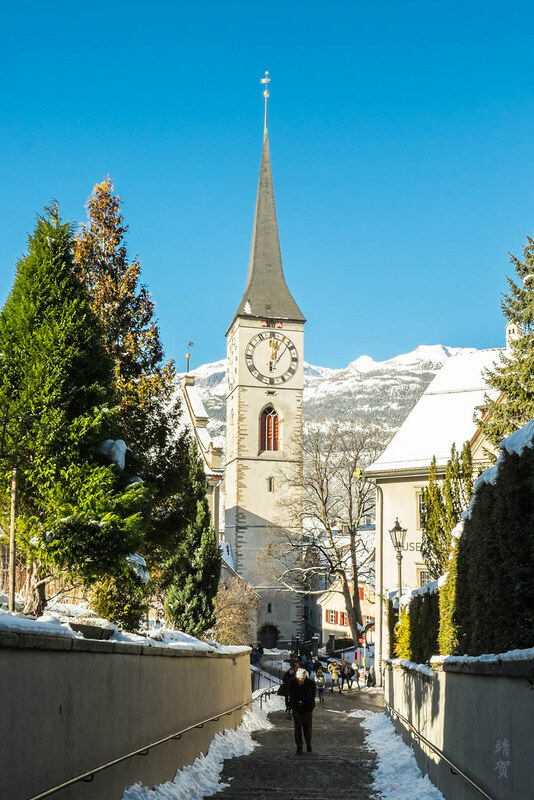 Once past Bever, it also signals that the ski resort town of St. Moritz is near. However there are more stops before that as this area has plenty of residents since it plays hosts to many foreign visitors in all seasons along with guest workers. 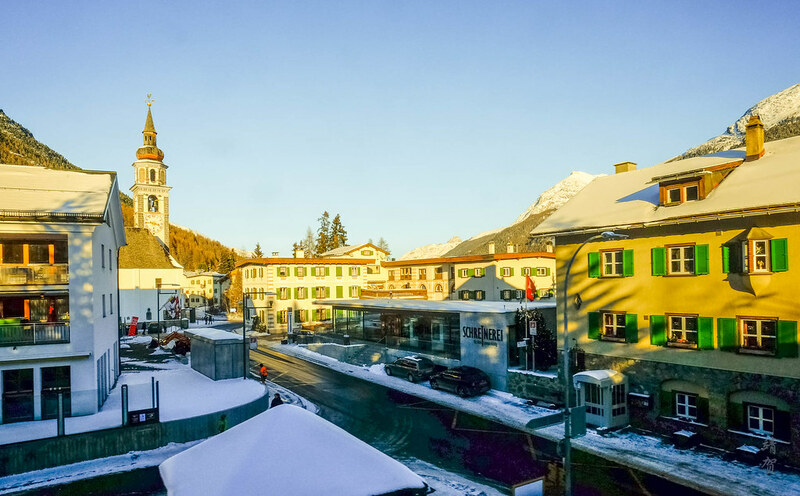 First up is the stop at Samedan which is the town nearest to the airport serving the region, then the train makes another major stop at Celerina where many skiers would come onboard as this town has a chairlift that links to Corviglia in St. Moritz. Skiers could also come down to this side from St. Moritz and some would prefer to take the train back to town at the end of the day. 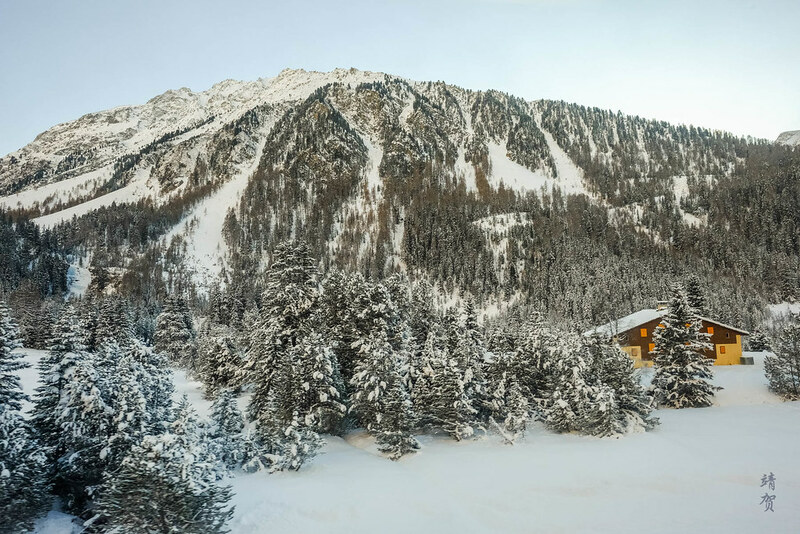 From Celerina, it is a direct route to St. Moritz where the train does stop for a while to allow passengers to disembark and embark safely. It should be noted that the train continues onward to Tirano and the Bernina Line that is part of the UNESCO World Heritage starts from Thusis all the way to the end at Tirano. While I did continue on my journey to Tirano as I would be heading to Milan, I took the evening train which meant it was dark out and there was not much photo opportunity. 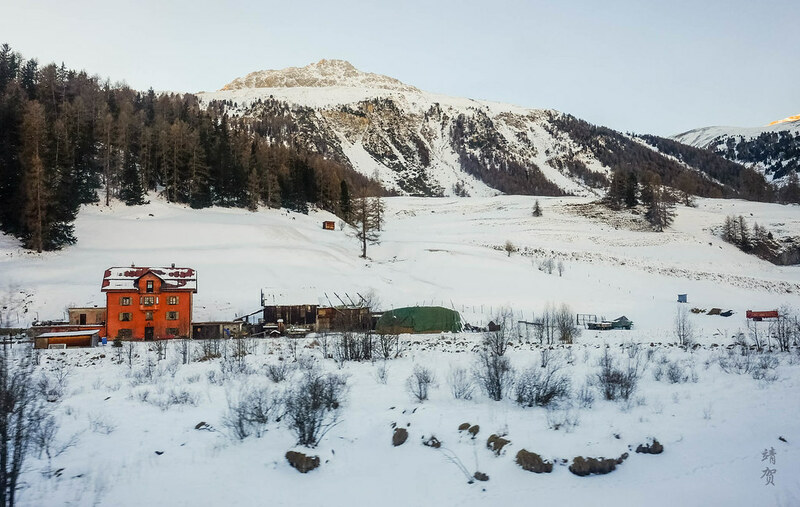 It should be noted that skiers could also take the train from St. Moritz to reach the other ski areas that is covered by the same ski pass in Celerina and Diavolezza. 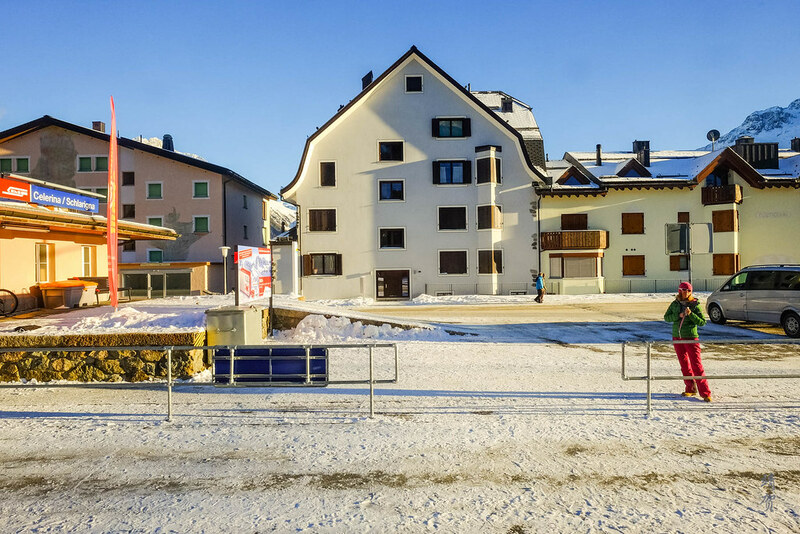 Celerina is linked to the main ski area in St. Moritz but Diavolezza is in its own area and can only be reached by train, bus or car. Fortunately, the continuing journey passed the other major point of interest along this line at the right moment as the sun sets. Lago Bianco or the ‘White Lake’ is a huge lake that travellers can admire from the train after it makes a stop at Diavolezza. It is true that travellers can really feel the majesty of Engadin through this lake which embodies pretty much of the scenery in this area. Ending this train travel at St. Moritz really made my day all the much better since I was headed to a new destination to ski. 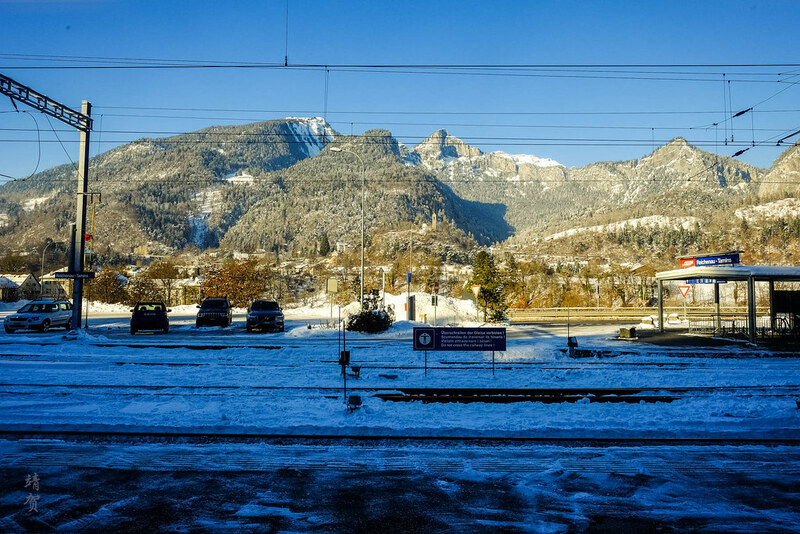 Spending a few hours travelling by train might seem arduous but with the beautiful alpine scenery and charming towns along the way, I enjoy the few hours on this slow moving train. 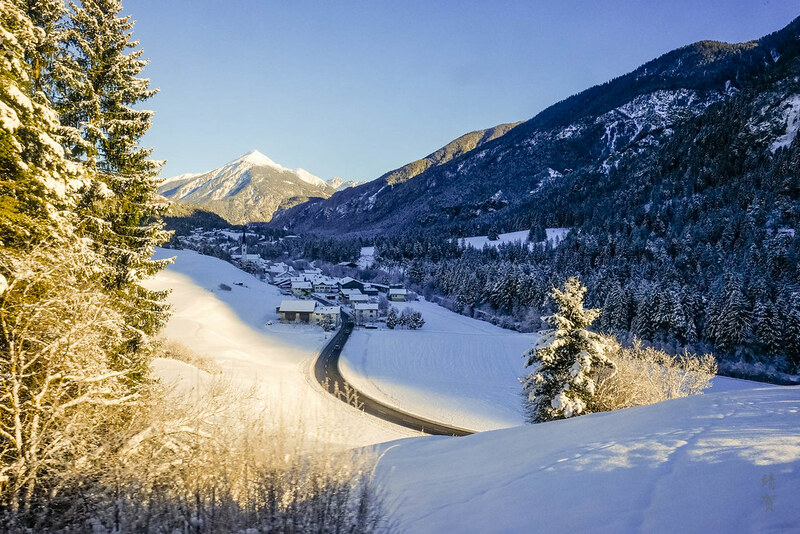 Being able to see the changing landscapes of Graubünden, admire the snow-capped peaks and experience a journey across tunnels and steep mountain valleys are what makes the Bernina Line one of the most rewarding train routes! With that I end this post with 2 sunset panoramas of Lago Bianco and I hope readers enjoy this trip report. Thank you so much for sharing your beautiful experience. I would like to do this but was feeling intimidated and didnt know where to start but after reading this, and learning a lot from your experience i have summoned my courage and confidence. Yes i can do this. Thank you again. A very well composed post indeed. Thank you for sharing your wonderful experience in such detail. Bookmarked for upcoming travel plans! Suhaasi, thank you for your kind comments. I hope you enjoy the train journey in Switzerland as much as I do!